I built this thing for the dirt and snowy roads after a brief, spur-of-the-moment offroad jaunt on my brakeless street fix. I'd been riding fixed on the road for a year or two and love it. My Trek X-01 was neglected, as was my vintage lugged Specialized roadbike... not to mention the other gearies I've since tucked away. Then 63xc.com convinced me that fixed for the dirt might be more than just a foolish way to lose a kidney. 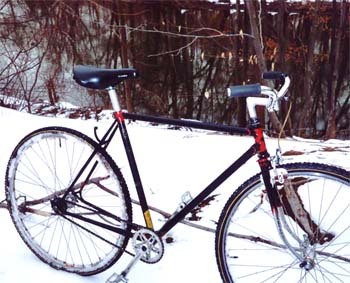 And I had this nice steel Centurion frame with big clearances in the stockpile, not too heavy and not too delicate. If I was going to build a fix for the local trails, gear choice was going to be crucial. I hate driving a bike, so I wanted to pick something that would be low enough to ride offroad, but that would still let me ride on the street to the trailhead. I built the bike up with a mix of components. On the rear is my first fixed wheel, rebuilt with 36-spoke Mavic Open Pro rim. The front is a road wheel from a junk pile. 700x35c Specialized cyclesross tires are cheap, light, and stout. The 170mm cranks are Road VXs, salvaged from an old Bianchi. I may replace them with 165s when I get a spare pair. The front brake is a centrepull to clear the big tires, NOS and all-steel by the look of it, marked 'Royal Enfield'. A junky MTB lever does for now but I will probably find something better. The same goes for the pedals which are junk BMX beartraps, a good fit for the VXs. Anyone who has followed the debate on on modern vs. 'retro' bike sizing should know why I say this is a comfortable ride. The handlebars do not feel too low, nor the seat too high. It also helps I'm using an older seat, and that the bars are slightly raised on the angled stem off my Trek 1000 roadie. This is my bad-weather, cruising about, hit-the-trail-and-see-where-it-goes bike. I plan on doing leisurely rides in the wood at first, no bombing downhills on a 30+ year old road frame. Meanwhile, I've already stripped down my rigid Specialized MTB for eventual conversion to either a singlespeed, or fixed. Guess which of the two it'll probably be? Brian Matula recently graduated with a degree in English. He has been tinkering with bikes for while but recently got the fixed bug. He has several bikes beside his knobby tired Centurion fixie, and is slowly refurbishing an old Orero track bike. Brian writes on this site about riding the NJ trails. Here's another way to fix a Centurion.